I just completed the finishing on a baby set including Elizabeth Zimmerman's Baby Sweater on Two Needles (Knitter's Almanac), Norwegian Baby hat (free Ravelry pattern), Striped Baby Mitts (free Ravelry pattern) and Amy King's "Baby Keep Your Socks On" booties (free on her website). The yarn I spun from the Spunky Junkies Fiber Club Feb 08 selection, "Think Spring" in South African Fine. It was amongst the several nice hanks of yarn I either finished or spun during the Tour de Fleece in July. I usually am lagging far behind in fiber club spinning, but July got me charged up, and I wound up with several hanks of yarn I really love. I've crossed the threshold to where I'd rather knit from my handspun that from anything commercially prepared. My "Think Spring" turned out to be sport weight, and is very soft, squishy and in perfect baby colors! I spun it using the fractal stripe method described in Spin Off last fall. While at SPA a couple of weeks ago, I was talking to Amy about an idea a few months back that she should kit up the BSJ in two Spunky colorways that share a color or coordinate. She said I could take whatever yarn I wanted at SPA to knit her shop a sample BSJ, and so I did. I dug into her basket of sport weight yarn, and retrieved a hank of Pluto Fire, and one of Pulse, and away they came north with me after SPA. 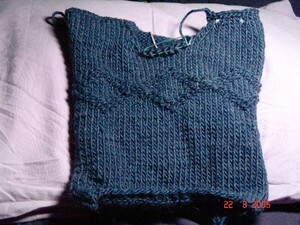 If you haven't figured it out, or are new to reading my blog, I have ADD with regards to starting knitting projects. So, while I still need to finish sleeves on a top down raglan, and I still want to re-cast on the Bee Fields shawl in a Woolen Rabbit colorway, I immediately cast on the BSJ. My previous versions of the BSJ have been tame and lame compared to this one. I absolutely love the combination of colors and the energy Amy's colorways brought to this project. I am even thinking this color combo might just become my trademark colors for all baby gifts in the future. 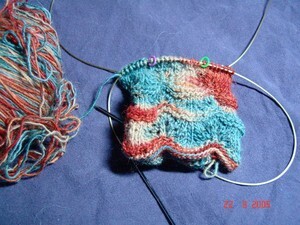 I used virtually all of both yarns. I knit 10 or 12 rows, then started a Fibonacci sequence for the striping, ending with the Pluto Fire colorway since it was my favorite. The button bands used both colors again - the Pluto Fire on the edges and the Pulse in the centers. The top left photo has the most accurate color depiction. This was a fun project, and it was sent off to Amy's shop this Thursday morning. I work with a couple who are expecting twins in February. I've always been a sucker for twins, and always thought they'd be fun to have after the first six months or so. I historically knit something for babies of my peers at work, but not necessarily for other co-workers, just because of the sheer numbers. 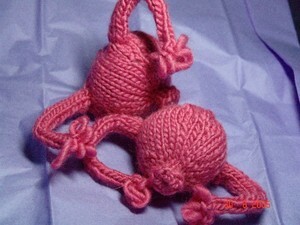 I'd never be able to knit anything else. However, twins are another thing. As a mother of four, I love love love hooded sweaters for babies. I prefer wool for baby sweaters since it will stay warm, even if it gets wet with drool, spit up, or other fluids of life with babies. This set of twins is fraternal boy/girl. I contacted Amy and had her do up large hanks of Moody Foods and Dinah for me - the former for the boy, and the latter for the girl twin. Here is the one for the boy in Moody Foods, sport weight superwash. Next time I do these, I think I want to get some semi-solid to coordinate with the handpainted yarn for the gansey bands in the front and the center back. The colors here are not true - there is more green, the yellow here is really more of a lime, and the purples are deep red-violets. I love the way the yarn highlights the architecture of this sweater! Now I need to find the perfect buttons! I'm slowly getting back into the fiber swing. 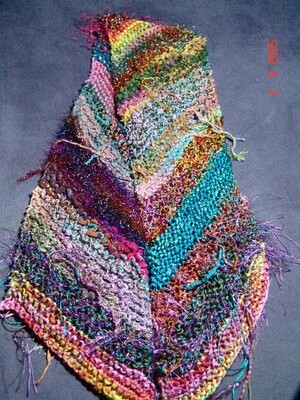 I am in desperate need of organizing and tidying up my fiber - the chaos, although nice fiber, is starting to get to me! I really need to be working on my sample for a knitting techniques class but I haven't started on it yet (sorry, Michelle!). I have infused myself with color this week - I got Three Little Fish sock blockers (they match my goldfish orifice hook from Margene). They have scroll work to help speed along the drying process for the socks, and even have a snail friend inching along the bottom! 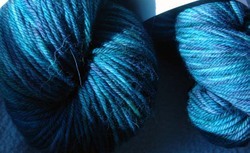 And then, because my co-workers are younger than I and having babies, I got some teal painted superwash worsted weight wool for a Babies and Bears sweater for one of them. The light in late New England afternoon didn't do justice to the colors - trust me, Jessie did a great job on the colorway! And my last infusion of color this week is from Yarn Wench - 5.6 oz of domestic wool dyed in "Carnation" just in time for Valentine's Day colors! I need to start setting aside Tuesdays for spinning a la Harlot - time slips by me, and I realize it has been far too long since I got into the Zen of my wheel! Does anyone have any suggestions for a source of small scale chairs? I want a chair with a back on it for spinning. My problem is that I am short (5' 2"), and I have to sit way forward on most chairs in order to have my feet touch the ground or the treadles. So, I am seeking a short person chair for spinning..... open for suggestions! It seems like I've made more progress than my photo albums would indicate. I made four Babies and Bears sweaters and a baby summer cardigan since May, all as gifts, and have zero photographs to show for the work. 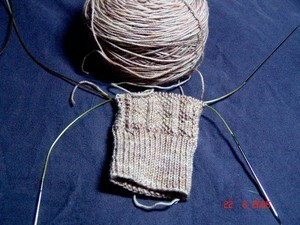 My Spearfish sock is actually looking like a sock with the cuff, leg, heel, and gusset complete. This yarn, Done Rovings, seems more scratchy in the cuff when I was using larger needles than it does in the rest where I used a Size 1 needle. 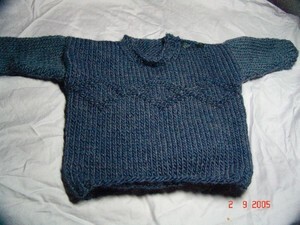 This is the finished bulky Brown Sheep baby guernsey ("Pronto" by Minnowknits). I like this one, not only for how quickly it knits up, but also because it has two buttons at the shoulder to make it easy to get a child's head through. Not an heirloom guernsey, but then this is a gift for a non-knitting mom. And finally, I started and finished the mindless diagonal scarf. Normally, I am not a scarf person, and I certainly am not much for novelty yarns. This year has been one for me to branch out into colors, and for whatever reason, this Cool Stuff Prism yarn has attracted me. And so, this mindless piece of knitting fit the bill for waiting for orthodontist appointments and horse riding lessons. Should work well with my on-sale black winter jacket! 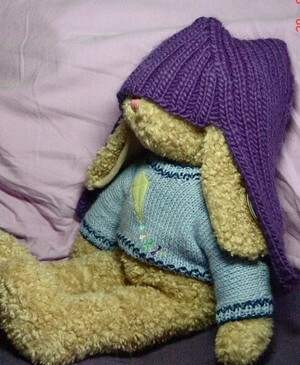 And of course, no knitting blog is complete this week without a plea for knitters out there to assist the victims, human and animal, of Katrina. 12" SQUARES FOR THE VICTIMS/SURVIVORS OF "KATRINA"
4. Please do not finish off the squares, that will be done when the assemblier is piecing the afghans together. PLEA for YARN donations - if you don't feel you want to contribute to being a square maker - would you enterain the idea of donating yarn? Any yarn or square donation will be greatly appreciated. Please contact Sonni via E-mail at: sonnis_hooked_on_crochet@yahoo.com and she will email you with an address to where the squares/yarn can be sent.
. It was knit for the French teacher as well. She apparently teaches using role playing with characters denoted by various wigs. (I did not know that until she asked me to make her a purple Hallowig). I couldn't get the 16 year old daughter or the 13 year old son to model it - I am really becoming the most outrageous and embarassing mother in the universe. So, I borrowed the stuffed rabbit from one of the kids to serve as my model.... I thought the dogs would destroy it if I tried it on them. By the end of tonight, my baby gansey should be done - I only have a few more rows on the last sleeve, and side seams to sew up. Weaving in ends, buttons, neckband are all done.... I'll get a FO picture of it before it goes to its recipient tomorrow. Tomorrow is the first day of school. Will take the kiddies (16 & 13 hardly count as kiddies) for breakfast and drive them to school for the first day. There will be enough days ahead this year for them to wait for the bus in two feet of snow... I am on vacation this week, so I'll enjoy it with them, then enjoy my rare time alone while they are at school! I just finished a Babies and Bears cardigan (my fourth of these since February) my sister requested for her co-worker. The photo will have to wait for another day - I have been using Fantasy Naturale in various colorways, and having fun with buttons on those. I also knit a summer cardi for a co-worker's baby's first birthday present in Mandarin Petit, which showed every imperfection in my tension, but is a really soft yarn. 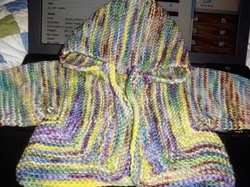 Still on the needles, I have two other baby projects (I have VERY prolific co-workers!). 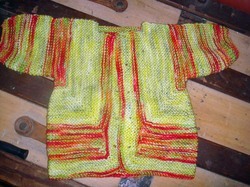 The first is a bulky pullover called Pronto by Minnowknits. I used bulky Brown Sheep in Blue Magic I had in my stash. 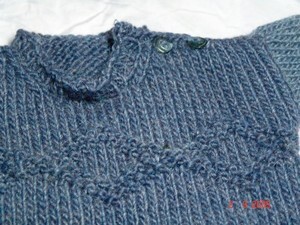 It is a quick knit & I always liked the shoulder buttons on kids' pullovers. Maybe my kids just had big heads, but it made putting them on so much easier! Then there is a gift for my oldest son's former roomie & his wife. 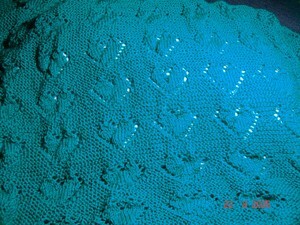 Since she is a young, new non-knitting mother, I chose Brown Sheep superwash in Serendipity Turquoise purchased from my LYS. I like the baby blanket by Fiber Trends, but by the time I finish this crib sized blanket, I will be thoroughly sick of knitting little hearts - all 135 of them! And that brings me to my choice for the Six Sock KAL Amble sock for which I selected Socks That Rock in Rose Quartz, and almost solid very pale rose that is incredibly soft. The wonderful foks at Threadbear were kind enough to blog and show that yarn to us all, and I fell for it. I REALLY like this yarn! Easy to work with and incredibly soft. The guernsey style patterning is easy and pleasing and it shows well in this pale, "solid" color. 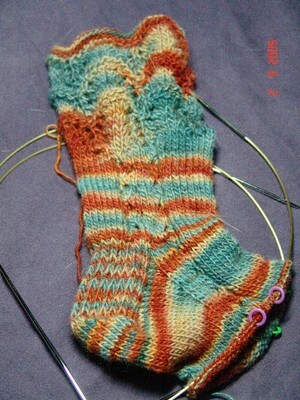 I have Spearfish socks in progress in a Done Rovings sock yarn from my stash, purchased last year I think at my LYS. I recently finished several projects, but most have been given away already. I have been forcing myself to whittle down the number of UFOs, because the pile of knitting projects next to my bed was getting out of hand.